Apple's Q3 2018 earnings are expected to be the weakest of the year. Apple’s weakest earnings report of 2018 is set to be revealed today but it might also contain a few clues about the 2018 iPhone launch this fall. Tim Cook and Apple CFO Luca Maestri will talk to investors on an open call at 2 p.m. Pacific. Analysts don’t expect a huge boost in iPhone sales and revenue (in fact some are downright pessimistic). However, Apple could pull out a few surprises like it did the last two quarters. Per usual, Cult of Mac will be here to live-blog all the action starting at 1:30 p.m. (That’s when the earnings report typically lands.) Come join the fun! I’m glad Tim took the time to dig a little deeper for the follow-up. At first I thought he was just going to blow it off. That question was the most interesting of the day. Possibly the most interesting I’ve ever heard on a quarterly investor call. Interesting follow-up – is the iPhone the only real on-ramp to the Apple ecosystem? Tim kind of dodges, but then gives a pretty thoughtful answer. People love AirPods and Apple Watch, he says, and sometimes those devices draw people to Apple’s ecosystem. Other times, it’s what you’d expect – the massive-selling iPhone is the big hook that pulls people in. It’s different for everyone, he says. Bottom line: If you’re in the Apple ecosystem, you’re in. Either way, Apple wins. Now a question about HomeKit and home automation. Can Apple compete? HomeKit gadgets have been relatively slow to market, and HomePod was notably delayed. TIm Cook says that all Apple needs to overcome slowing global smartphone sales is great products, like the iPhone X.
LOL … Just drool over all the promising original Apple TV shows currently in development then. By the time those come to fruition, you will just hit Play on whatever device is nearest you at the time. Wow. I wrote almost exactly the same thing, Lewis. I’ll post it to show how much we agree: I think it could be “Apple TV”. An Apple TV is needed to access Apple TV. My question is what are they going to call their TV streaming service? Apple TV is the most obvious but that’s taken. iTV? Apple’s TV content feels like the rhinoceros in the corner. Not talking about it is getting really awkward. Apple Music sits at well over 50 million users, Tim says. (That’s paid subscribers as well as people in the introductory trial period.) The service has a “leadership position” in Japan … as well as the top spot in paid U.S. subs. Well, obviously Tim’s not going to talk about anything that hasn’t launched yet. Whether it’s TV shows or new iPhones. But once again, Tim Cook dodged a question about what Apple’s going to do with all the TV content its paying to create. He’s excited about it. Great. But what is the plan? Apple is working on a TV project that Tim says they’re not ready to share yet, but they have great talent in the area that they’ve sourced from different places. The project will accelerator faster than people expect. Dramatic changes are going to speed up in the content industry. Tim says he’s just not ready yet to talk about what he’s working on. I like it — a question about Oprah Winfrey’s multiyear deal with Apple. Not surprisingly, Tim is “excited” and “could not be happier” that she’s on board for Apple’s original content push. “There’s an inescapable mutuality that serves the bring the US and China together,” says Tim Cook. Both countries need each other in order for the world to do well. He says he’s hoping that calm heads prevail. As far the tariffs that have been imposed (the steel and aluminum tarrifs and two others that total $50 billion of goods), none of Apple’s products are directly affected. There is a fourth tariff that is out for public comment. Apple is evaluating it and will share it’s views on it before the comment period is over. Apple enjoyed its fourth consecutive quarter of double-digit growth in greater China. Other products, including Apple Watch, did well in the country too. Changes might be needed, but tariffs typically aren’t the best way to go about it, Tim says. Ooh, here comes the tough questions about iPhone sales. Average selling price is up higher than expected due to iPhone X, but … what about the actual units? They were good but not great. “Customers want innovative products,” Tim says. Take that, iPhone X haters! To throw in some numbers, Apple services took in $9.5B in Q2, up from $9.1B in Q1, and $7.2B in 2017Q2. I LOVE it when Tim talks about Apple’s magic pipeline. When asked how Apple plans to grow its services business over the next few years, Cook says that Apple is thrilled with results of double-digits services growth in all of its geographic segments. The combination makes Tim Cook think he can hit their objective even better. Few mentions of Mac sales in the presentation, which are down. Q2 was 3.7 million vs. 4.2 million year-over-year. Apple sold 11.5 million iPads in Q2, up from 9.1 million in Q1, and compared to 11.4 in the same quarter of last year. NPD says iPad had 60 percent of the U.S. market in Q2, up from 51 percent year-over-year. Oh hey! CVS is finally giving up on it’s war against Apple Pay! CVS will start accepting Apple Pay this fall. Mac install base had double-digit year-over-year growth. Even though sales were down. Luca says that was impacted by the MacBook Pro launch, which didn’t happen until the beginning of Q4. iPhone customer satisfaction peaks at 98 percent on the latest models, Luca says. And businesses are planning to buy iPhones for their employees, too. Will Apple ever get tired of winning? You’ve been saving that one, haven’t you? I guess talking up Apple’s $300 million green initiative in China probably plays well on a number of levels. Corporate action on climate change, feel-good stuff for people who like some social activism with their luxury electronics, plus real engagement in Apple’s second-biggest market. Finally! It’s time to be serenaded by Luca Maestri’s magical Italian accent. Checking the transcript now…. yep, it was even more boring than I remember. And no, I don’t … I might possibly have fallen asleep then, Buster. Have you forgotten the great investor call of August 1 2017 lewis? Apple always uses new software as a filler during this conference call. There’s not much else to talk about. Wow, 4 million people are beta testing iOS 12. Here’s hoping that means it will be (relatively) bug-free when the final version launches. I feel like this is WWDC Lite. I don’t remember Apple giving such an in-depth description of an upcoming iOS release during an earnings call. But I guess if Tim spends more time talking about how great iOS 12 and ARKit will be, he can spend a little less time talking about flagging Mac sales (and slightly less than expected iPhone sales). Like Tim, I see AirPods everywhere. Apple Watch has been a slow grower, but it’s coming into its own. Cloud services revenue jumped more than 50 percent. Tim’s going deep on all the successful products in the services category – stuff like Apple Music and Apple Pay. Even Siri and Apple News are getting the big C-suite salute! Subscriptions are great for Apple and developers. I’m not sure they are as good for iPhone and iPad users. Nice Google Play diss, Tim. Not surprising at all that the App Store is slaying the Android alternative in revenue. Revenue subscriptions are driving a huge portion of Apple’s services business. Apps that offer subscriptions is also continuing to grow. That’s great for Apple and developers. Paid subscriptions surpassed 300 million, up 60% year-over-year. Tim Cook coming out with the highlights: iPhone revenue up 20% YOY. Install base was driven by switchers and first time iPhone buyers. iPhone X was the most popular iPhone in the quarter. Hoping for some clues about the next iPhone launch. Apple expects to make between $60 billion – $62 billion next quarter. That suggests a big iPhone launch should happen around September. And here’s the obligatory GIF. Note: Not an actual image from within Apple HQ. Here’s the full rundown on Apple’s latest Street-beating performance: Apple surprises Wall Street with record-breaking Q3 profits. 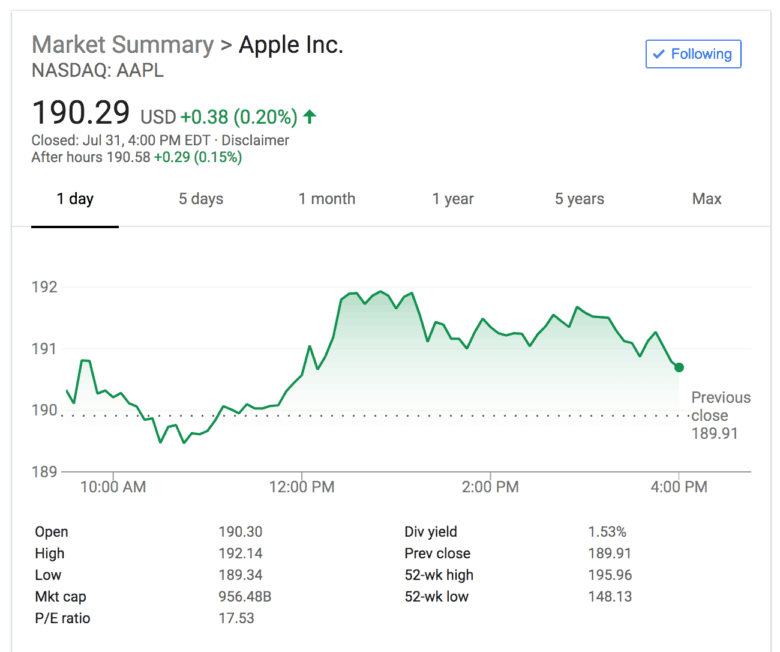 AAPL shares have already shot up to $195 in after-market trading. The company needs to hit $204 per share to become the first trillion dollar company. Apple also is predicting Q4 2018 revenue “between $60 billion and $62 billion.” That’s a key number, and it’s higher than most analysts expected. Make way for the iPhone X Plus (and a super-sized Apple windfall)! Nice time for the live blog to be acting up. If Apple blows it today, things are not going to look pretty for the tech sector. Yes, everybody will be waiting to hear the iPhone ASP (aka average selling price). Will the iPhone X’s $1,000-plus price tag still be a killer feature? Note: Not an actual Wall Street image. Apple anticipation lifted both the Nasdaq and the Dow Jones Industrial Average today. AAPL climbed 0.2 percent to close at $190.29. 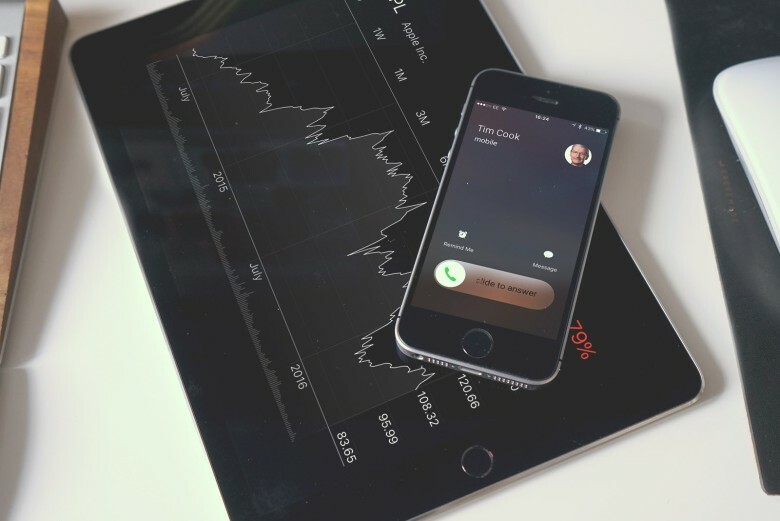 On Wall Street, all eyes (or maybe ears) are on Apple’s earnings call. It’s been a rough couple of weeks for tech stocks. Facebook shed $120 billion of its value last week in the biggest tech single-day selloff in history. Twitter has been getting hammered due to slowing growth. And just yesterday, Samsung took a hit due to weak Galaxy smartphone sales. Can Apple pull off the impossible and deliver results strong enough to keep Wall Street happy (or at least pacified)? We’ll know soon. While we’re waiting for today’s call to start, here’s your playbook about what to expect: 5 key details to watch for in Apple’s Q3 2018 earnings report.